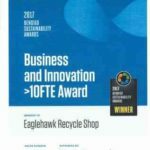 You never know what you might find…..
Operating since 1994, the Eaglehawk Recycle Shop is a not-for-profit enterprise with the aim of diverting reusable items and recyclable waste from landfill and creating local jobs for people previously unemployed. People have a choice of paying $175 a tonne to dump in the landfill or they can sort their load and drop it off at the Recovery Centre. There is a long list of items that can be dropped off. Some items have a fee attached, have a look at the drop off page to see what items fees apply to. Unsure if what you have can be recycled? SORT: People have a choice of paying $175 a tonne to dump in the landfill or you can sort your load and drop off items that can be recycled or reused at the Recovery Centre which will reduce your costs at the landfill. REUSE: It makes sense to reuse instead of buying new all the time. You save energy by not reproducing all the time so it’s great for the environment, it’s much cheaper to buy secondhand and you can get a great deal of enjoyment from cleaning up or repairing an item. People reuse items for a wide range of reasons. So what you may think is rubbish, someone else has another use for it and you are not putting it in a costly hole in the ground and adding to the creation greenhouse gases. 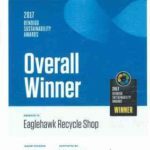 SHOP: The Recycle Shop sells cheap secondhand items from antiques to household items to building materials and now with the addition of the ERS Bazaar you can even find clothing. Things change all the time. A visit can be very entertaining and you get to use your imagination and you can leave feeling a little excited about your purchase and the prospect of what it can become. Some customers have furnished or built their homes from items purchased at the shop. It never ceases to amaze us what comes in each day. Follow us on facebook to know about some of the new items in the shop. Talk to our customers about how they use items they purchase. Looking for something to do? It’s worth a visit and bring your visitors to enjoy another great Bendigo attraction.